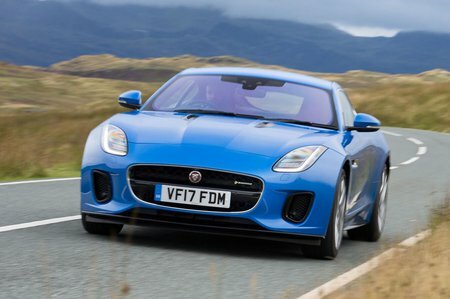 Jaguar F-Type 2.0 R-Dynamic 2dr Auto 2019 Review | What Car? What Car? will save you at least £4,745, but our approved dealers could save you even more. R-Dynamic adds a switchable sports exhaust, gloss black design pack, 19in wheels, LED headlights and aluminium trim inside. Opt for the V6 380 and the wheels are upped to 20in, there’s a limited slip differential, bigger brakes and the option of four-wheel drive. This entry-level 2.0-litre unit is the best choice for business users because benefit-in-kind payments will be much lower than those for the bigger engines. However, it’s brisk rather than fast; there are quicker hot hatches out there. On the road, it doesn’t feel as flexible as the entry-level V6 and the anodyne exhaust noise disappoints. If you are a private buyer, we’d recommend upgrading to the V6. An automatic gearbox with rear-wheel drive is the only option.